Antonio and Amata Lotti, natives of Roccaporena, a tiny village in the Umbrian Hills of the republic of Cascia, were well-respected peacemakers in their town who welcomed their only child, Margherita in 1381. In the local dialect, her name meant “pearl” and she was known as Rita. 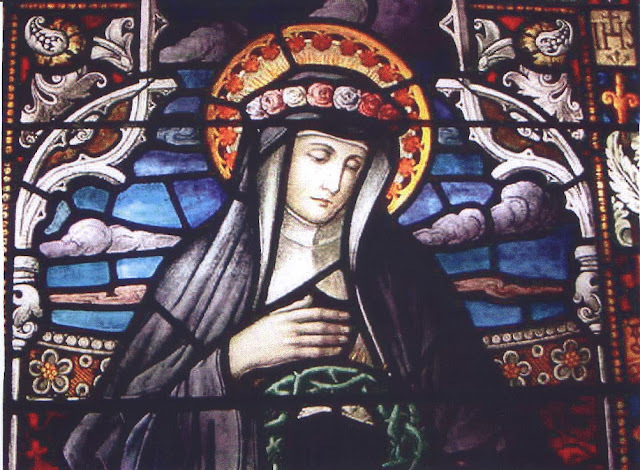 Baptized in the church of St. Augustine in Cascia, Rita became acquainted with the local Augustinian nuns of St. Mary Magdalene and was attracted to their way of life. But her parents arranged a marriage for her in order to provide safety and security, and so Rita obediently married Paolo Mancini with whom she had two sons. In the climate of the times, there was often open conflict between families, and her husband Paolo was murdered. Her sons were young, but the expectation would be for them eventually to avenge the murder of their father to defend family honor. Rita, influenced by the peacemaking example of her parents, pledged to forgive her husband’s killers. She faced a steep challenge, however, in convincing her sons to do the same. Tradition has it that she often pointed out to them the image of the crucified Christ and the fact that he forgave those who killed him. Within a year, however, both sons succumbed to a deadly illness leaving Rita not only a widow, but also childless. Following these tragedies, Rita placed her trust in God, accepting them and relying on her deep faith to find her way. After eighteen years of marriage, Rita felt called to a second but familiar vocation, to religious life in the Augustinian convent. But the sisters were hesitant and refused her request; however, Rita was not discouraged, convinced that she was called to the contemplative community. The sisters even more firmly refused, citing that although Rita had forgiven her husband’s killers, her family had not. There were members of the rival family in the convent; her presence would be detrimental to community harmony. And so, inspired by her three patron saints (Augustine, Nicholas of Tolentino and John the Baptist), Rita set out to make peace between the families. She went to her husband’s family and exhorted them to put aside their hostility and stubbornness. They were convinced by her courage and agreed. The rival family, astounded by this overture of peace, also agreed. The two families exchanged a peace embrace and signed a written agreement, putting the vendetta to rest forever. A fresco depicting the scene of the peace embrace was placed on a wall of the Church of Saint Francis in Cascia, an enduring reminder of the power of good over evil and a testament to the widow whose forgiving spirit achieved the impossible. At the age of 36, Rita finally was accepted into the Augustinian convent. She lived a regular life of prayer, contemplation and spiritual reading, according to the Rule of Saint Augustine. For forty years she lived this routine lifestyle, until fifteen years before her death, on Good Friday 1442, she had an extraordinary experience. In contemplation before an image of Jesus that was very dear to her, the Jesus of Holy Saturday or, as it is also known,the Resurgent Christ, she was moved by a deeper awareness of the physical and spiritual burden of pain which Christ so freely and willingly embraced for love of her and of all humanity. With the tender, compassionate heart of a person fully motivated by grateful love, she spoke her willingness to relieve Christ’s suffering by sharing even the smallest part of his pain. Her offer was accepted, her prayer was answered, and Rita was united with Jesus in a profound experience of spiritual intimacy, a thorn from his crown penetrating her forehead. The wound it caused remained open and visible until the day of her death. Toward the end of her life, Rita progressively weakened physically. Several months before her death, she was visited by a relative from Roccaporena who asked if she could do something for her. Rita at first declined, but then made a simple request to have a rose from the garden of her family home brought to her. However, it was January, the dead of winter in the hills of Umbria. But upon her return home, the relative passed Rita’s family garden and found to her astonishment a single fresh rose in the snow-covered garden on an otherwise barren bush. She immediately returned to the convent where she presented it to Rita who accepted it with quiet and grateful assurance. For the four decades she had spent in Casica’s convent she had prayed especially for her husband Paolo, who had died so violently, and for her two sons, who had died so young. The dark, cold earth of Roccaporena, which held their mortal remains, had now produced a beautiful sign of spring and beauty out of season. So, Rita believed, had God brought forth, through her prayers, their eternal life despite tragedy and violence. She now knew that she would soon be one with them again.